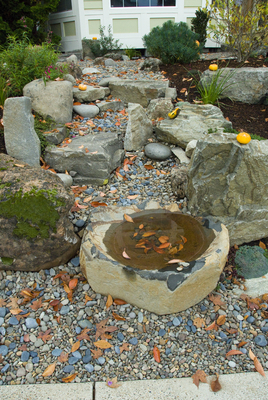 A dry streambed tumbles down a slope through Molalla and Windswept Mossy boulders to a basalt bowl creating a pleasing effect in this xeriscape by Gaia Landscape, Corvallis, Oregon. of that same streambed...a bold yet very pleasing use of color and texture by Gaia Landscape. This eclectic blend of materials selected by the customer and implemented by Gaia is a feast for the eyes. Specimen Windswept Mossy Boulders, a basalt column and bowl plus a vertical Glacier Green pillar create interesting focal points.